The User Dashboard is where you will manage your SportsEngine account. It contains your account settings, notifications, payments and more. Step 1: Click on your profile from the Profiles tab. Step 2: Click the Organizations tab. Step 3: Click Go to Website under the organization. If you have not clicked Become a Member on a website or registered an athlete for an organization, you will not see any organizations listed in your profile. In this case, you will need to find the organization website the old-fashioned way (ask an admin at the organization or google it). The profiles tab lists all athlete profiles created through your account. 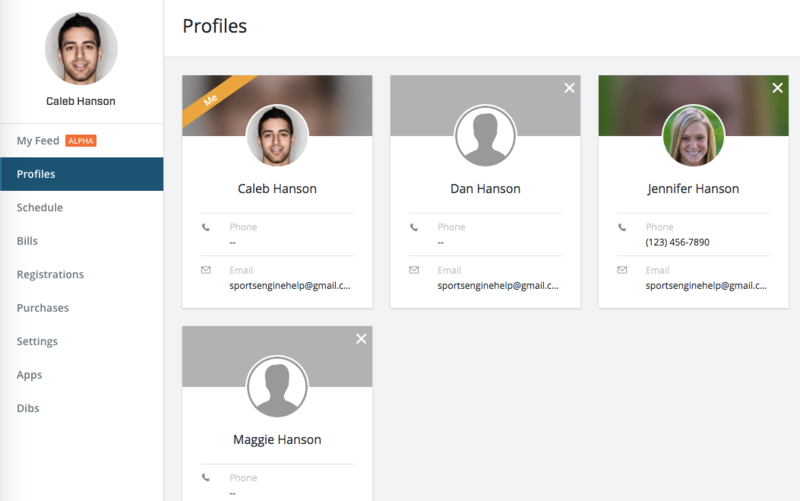 Athlete profiles are created when you register a new athlete through SportsEngine. From here you can change the athlete's name, date of birth, photo, and address. You can also view and edit past registration entries (if allowed by the organization) and view the organizations that the athlete is a part of. Your schedule will show you all of your past, present, and future events and games that you have for each team you are rostered to. You are able to click on the game link to RSVP to the event if you would like to. Here is where you can make a payment on an invoice, or view the bill activity for a more in-depth look into a particular bill. This tab will give you an overview of all of the registrations that you have signed up for under this particular SportsEngine account. The Purchases tab lists registration payments and other purchased items. From here you can update your credit card for a registration payment plan and cancel paywall subscriptions. From the Account Settings tab, you can change your name, password, login email address, contact info, and notification preferences. Learn how to receive text messages or unsubscribe from messages. The Dibs tab lists your Dibs (Volunteer) active sessions, claimed sessions, and completed sessions. Learn how to Claim a Dibs Item . This tab will be hidden if your organization does not use Dibs for volunteer management. Need to see your Messages or your Team pages?